Comments: Scout troopers are often assigned to small, ground-based units. They operate in groups of four called lances, and are relied upon to identify potential threats and notify the larger main force of stormtroopers. Comments: From the bridge of the Super Star Destroyer Executor, Darth Vader senses the approaching presence of Luke Skywalker. He allows his son's ship to land, and then travels to the forest moon of Endor to capture the Emperor's prize. Comments: After becoming separated from the Rebel strike team she had helped lead to the forest moon of Endor, Leia finds herself surrounded and befriended by the native Ewoks, who later help her team defeat Imperial forces. Comments: Chosen for what might have been the most important mission of the Rebellion, each of these Rebel commandoes is a master at small-squad tactics, sabotage and night-time combat. 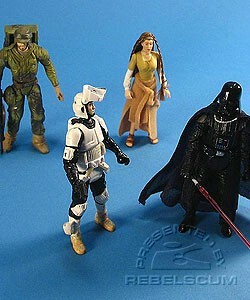 Darth Vader is a repack of 2004's VOTC Darth Vader. Princess Leia is a repaint of 1998's POTF2 Princess Leia & Wicket the Ewok set from the Princess Leia Collection. Rebel Commando is based on 1998's POTF2 Endor Rebel Soldier. This time around, the figure has a new head and removable helmet. In the Canadian set (shown here), the cardbacks are generic and the datafiles are instead included with a folded insert.